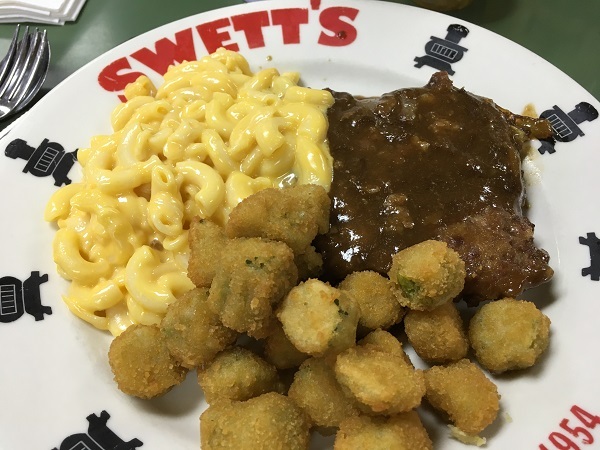 Swett’s, Nashville TN – Marie, Let's Eat! This old-fashioned cafeteria has been a local mainstay for more than sixty years, and was long overdue for a visit. The week after our trip to Memphis, we were back on I-24 heading west again. One of Marie’s favorite authors, John Scalzi, was giving a reading at Parnassus Books in Nashville, and my mother, in Alabama, had asked to see her grandbaby. 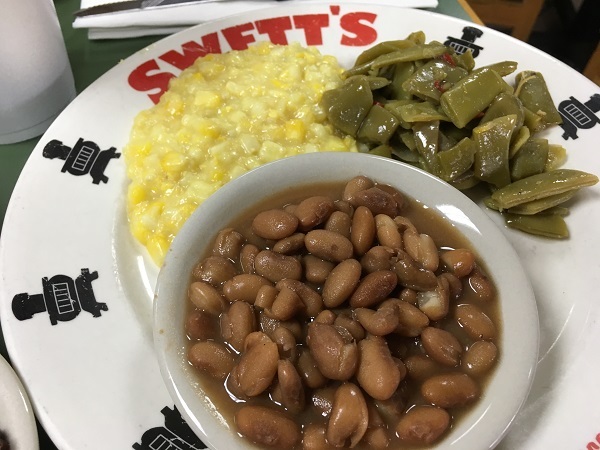 So we decided to make a day trip out of it, met my mom at a kind-of halfway point in Trenton GA to drop off our son, and arrived at Swett’s for a great big lunch shortly after eleven. Swett’s originally opened in 1954. It’s one of those many, many restaurants that I had read about without it really being hammered home just how much I needed to visit. Last month, I wrote about Scott’s-Parker Bar-B-Q in Lexington TN and called it my “critical hit” theory. I’d seen a little about Swett’s here and there in lots of stories, including a piece in John T. Edge’s book Southern Belly, but it wasn’t until we visited Nashville last year and had dinner at Antioch’s 360 Burger, which some other members of the Swett family own, that I decided this was a priority. Swett’s is what you might call a pillar of the community. 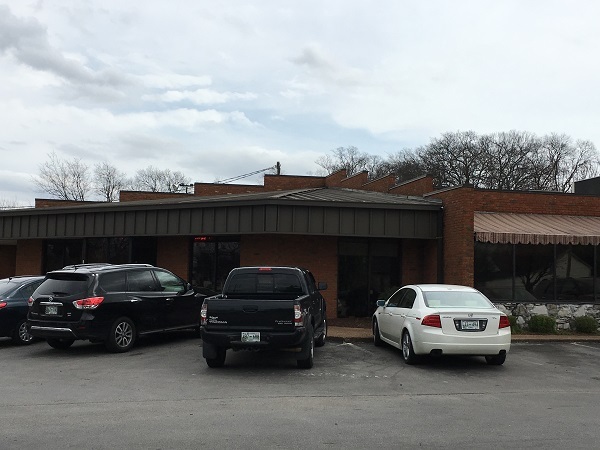 More than one business in this predominantly African-American neighborhood were started by the Swetts; the strip mall across the street also bears their name. Politicians come here for votes, chiefs of police come here for some peace and quiet. But mainly it’s people coming here to eat. Lunch here was not too packed. We seem to have arrived before the rush, and enjoyed a very tasty meal. Marie and I decided that we would order one meat to share, and five sides. She settled on country-fried steak, and we shared mac and cheese, fried okra, creamed corn, pintos, and green beans. She didn’t care for the okra at all, but I thought it was pretty good. We enjoyed the creamed corn most of the sides, though. We didn’t take pictures of our desserts, but we enjoyed those most of all. She loved the blackberry cobbler, but not half as much as I loved the chess pie. Wowza. That chess pie was really fantastic. That’s going to be the first thing to cross my lips whenever anybody mentions Swett’s to me until the end of time. I thought about another pass through the line and another slice of pie, or possibly a taste of their barbecue. About a week before our visit, the Barbecue Fiend had written about his trip here. We also noticed that their separate “smokehouse” room was closed, with a sign directing people to the cafeteria line. I decided against it, no matter how much I liked that pie or how curious I was about their pulled pork. We enjoyed what we ordered, and we’ll save other questions for another time. Posted on May 31, 2017 by Grant G.Posted in nashville, southern, tennesseeTagged cafeteria, nashville, southern, southern belly, tennessee.